We are reapplying for UK standard visitor visa for my sister. The refusal ground was about the proof of salary received. This time we are providing BIR 2316 Certification of Compensation Payment /Tax Withheld from the company, but in that form they only stated the basic salary and the 13th month bonus my sister received. They didnt include the allowance of Php 1500 my sister received at the end of every month in the said certificate. They didnt also want to give copy of the voucher for this allowance. And it was not also included/does not appear in her payslips. The problem now is we stated the basic salary + allowance in the online application form we submitted. We are worried now that this will be another ground for refusal- proof of allowance received. We dont know how to explain it in the cover letter.. since the company doesnt want to give proof or even a letter explaining about it. We are submitting my sister savings account bank statement from december 2018 to present date... together with LOA, COE, payslips and the BIR 2316 ANNUAL Compensation Payment to answer the refusal ground. Any advice how to explain the allowance in the cover letter? Her visa appointment is on March 4. 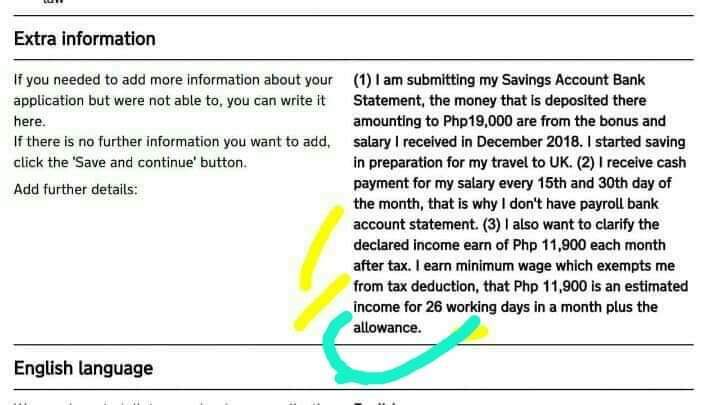 This is our concern, we mentioned it in the online application form, there's question about income earn each month after tax. We want to further clarify it in the cover letter but we dont know how to explain it well, and not be another reason for refusal. Browse other questions tagged visa-refusals standard-visitor-visas philippines ukrainian-citizens or ask your own question.